Delray Beach – September 28, 2009 – Combining sand and surf with art and culture will be the unique lure of a new luxury boutique beach resort in Palm Beach County, opening in November. The Seagate Hotel & Spa, 1000 East Atlantic Avenue, opening on November 6, 2009, is the first new beachside property in Delray Beach since 1982. The 162-room hotel features an 8,000 sq. ft. Seagate spa/fitness center, restaurants and elite privileges for guests at the private Seagate Beach Club. Amenities of The Seagate include the Atlantic Grille, where a talented culinary team brings inspiration to oceanfront dining at two seaside restaurants. The Seagate Spa offers a complete range of treatments; fitness classes; Vichy shower and a Bikram Yoga studio. The Seagate Beach Club, located directly on the beach, offers exclusive guest benefits and additional dining venues. 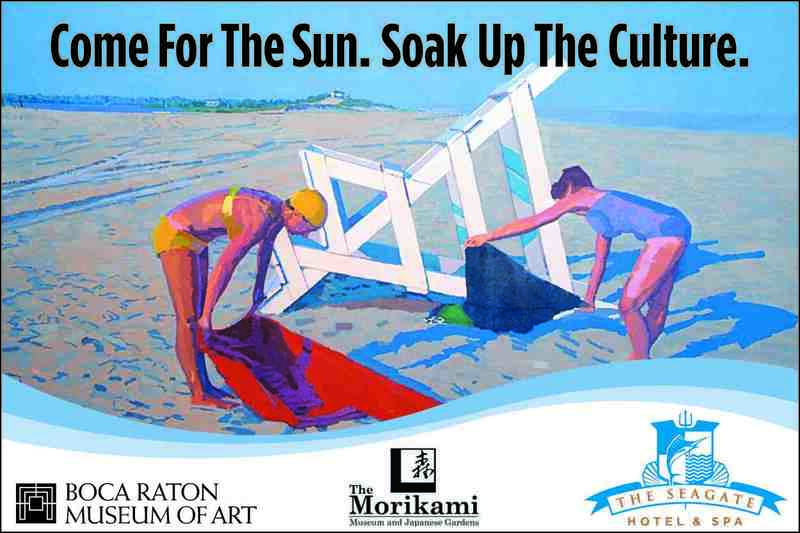 To celebrate the opening, guests who reserve a Deluxe or Superior room for two consecutive nights in November or December receive a “Cultural Getaway,” – admission for two at each of the area’s finest art and cultural destinations – the Boca Raton Museum of Art and The Morikami Museum and Japanese Gardens. The idea was developed by Bruce Herman of the Boca Raton Museum and Kristina Schmidt of The Morikami to create an enticing getaway package for visitors wanting to enhance their vacation with culture, while enjoying one of the most popular tourist destinations in the world. MDG Advertising, Boca Raton, Florida, is coordinating the advertising campaign for the collaboration. The collaboration offers new and returning visitors an opportunity to enjoy southeast Florida beyond the beaches. The Boca Raton Museum will exhibit Unfinished Conversations: Collecting Enrique Martínez Celaya, November 17, 2009 – January 10, 2010, which features 19 monumental works from filmmaker Martin Brest’s (Meet Joe Black, Scent of a Woman) personal collection. In November, The Morikami will unveil its Japan Through the Eyes of a Child interactive exhibit, featuring four “environments” – a train station platform, an elementary school classroom, a street of shops and a Japanese house. Both museums will appeal to holiday travelers with festive programs and opportunities for gift shopping in their specialty stores. More information is available at www.CulturalGetaway.com. The Boca Raton Museum of Art, a leading cultural organization in South Florida, is internationally recognized as a world-class arts institution, presenting dynamic traveling exhibitions, and an outstanding Permanent Collection. Programs include films, lectures, family days, and a studio Art School. 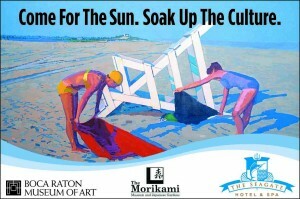 For more information call 561-392-2500 or visit www.bocamuseum.org. The Morikami Museum and Japanese Gardens is the only venue dedicated to the living culture of Japan in the southeast United States with 16 acres of gardens, a Cornell Café, museum store and ongoing educational and public programs. For more information call 561-495-0233 or visit www.morikami.org. Michael Del Gigante is president and executive creative director of MDG Advertising in Boca Raton, Florida. MDG Advertising is a full-service advertising agency that specializes in developing targeted marketing solutions, exceptional creative executions and solid branding strategies that give clients a real competitive advantage. For more information, Contact MDG Advertising.